I would love to hear how your vacation went! How were all the arrangements—especially the hotels? Were there any wonderful, unexpected experiences—restaurants, views, side trips?—You get the picture! "A sub-title for this morning could have been, 'Guess Who's Coming To Breakfast'. 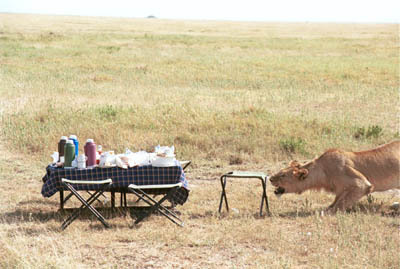 We had a picnic breakfast at the most southeast of the Barafu Kopjes. Our trusty Land Cruiser was parked between the picnic table and the rock of the kopje. While we were eating, Jack saw 6 dots approaching from the crest of the hill —about 200 yards away. He said that the wildebeest were coming. WRONG! 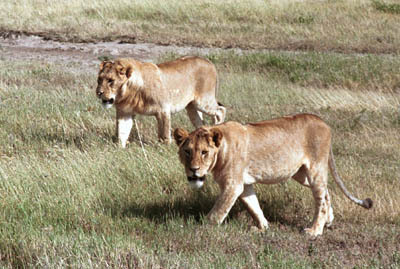 They were 6 young lions (1 or 2 females and 4-5 males). moments, looked again and kept coming!! 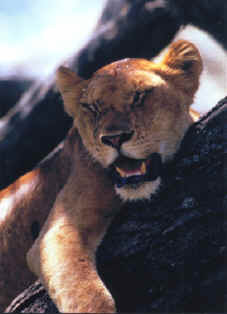 how fast the lions can react. 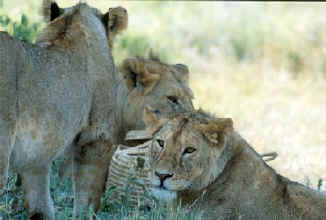 "The basket then became a toy as the other lions joined the first on the ground. 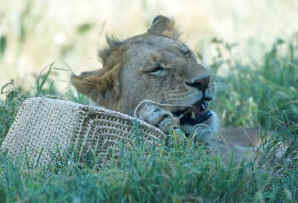 Once the cover was torn off the basket, one lion grabbed the top and began parading around the kopje with his new prize. 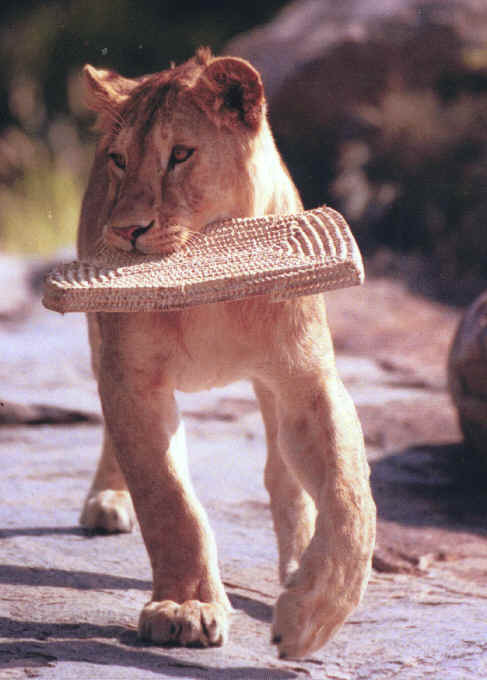 "There had been a cloth napkin in the bottom of the basket and a third lion picked this up and very proudly displayed his new toy. 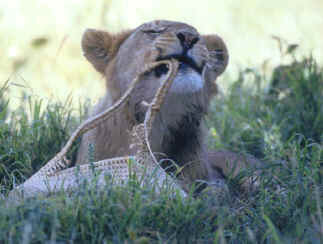 Meanwhile the lion with the basket took it under the tree, placed his big front paws around it and began licking it. 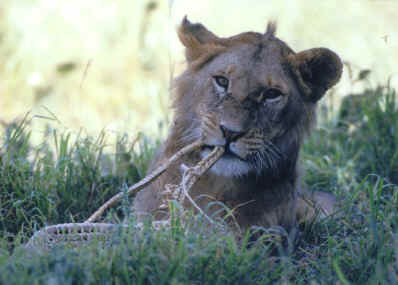 Eventually, he noticed the woven straw handles on the basket and began to tear them off, too. 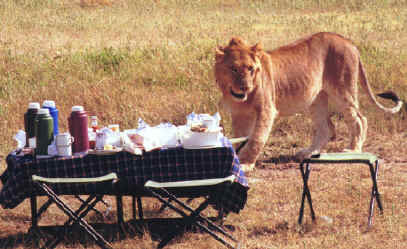 "One of the lions, we're not sure which one, went back to the picnic table to see if there were any additional prizes. He took on one of the camp stools. He lunged at it and it didn't move. He lost interest and laid down with his friends between the picnic table and the rock. "Now the problem became one of how to rescue the table, chairs, china, silverware, Tupperware etc. that the lions didn't want. Elias and Astarik from the safety of our truck tried shouting and waving the machete that they kept under the seat. No effect. They tried moving the truck slowly toward lions. Nope. 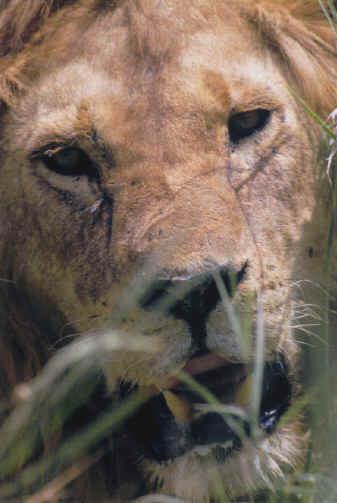 The lions weren't hostile; they were just indifferent. lions) and we left the basket and napkin behind for some other group to find. We could just see the potential CNN headline, 'SAFARI GROUP RAIDED BY LIONS. BASKET AND NAPKIN ARE ALL THAT REMAIN'." Photos and text courtesy of the authors. “It was the best of times, about to become the worst of times. A fairytale wedding was planned for Shanna and me in her hometown of Peterborough, ON, CA. After ten months of planning all was set, including a dream honeymoon to Italy, which was planned by Harriet. “Monday morning following our wedding we left Canada at 4:30AM to arrive in Boston with plenty of time to pack for a 6:00 PM flight to Italy the following day. At 8:00 AM we were at the US border crossing. It was then that we learned that Shanna’s temporary work visa was no longer valid since she was now married to a US citizen. The US Border Guard advised her NOT to leave the country until permanent papers were filed (a process that takes considerably longer than the 34 hours we had before our flight). 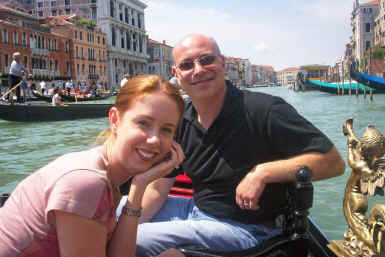 “After several frantic calls to the INS and an Immigration Attorney, all telling us not to leave the US, we had given up hope of making our dream honeymoon to Italy. About mid afternoon we called Harriet to inform her that we would be canceling our honeymoon and why. That’s when she advised us to call Senator Edward Kennedy’s office for assistance with an emergency visa. Finally, after 5 P.M. we spoke with a very helpful woman, Emily Winterson, at the senator’s office. She advised us come in to visit her on Tuesday morning, our departure day. After several phone calls to the ‘right’ people we were assured that there would be no problems upon reentry to the US . “So, as it turned out, thanks to some great knowledge of Harriet’s we got our clearance to go to Italy. It all happened only four hours before we were to be taken to the airport. Our honeymoon was saved!